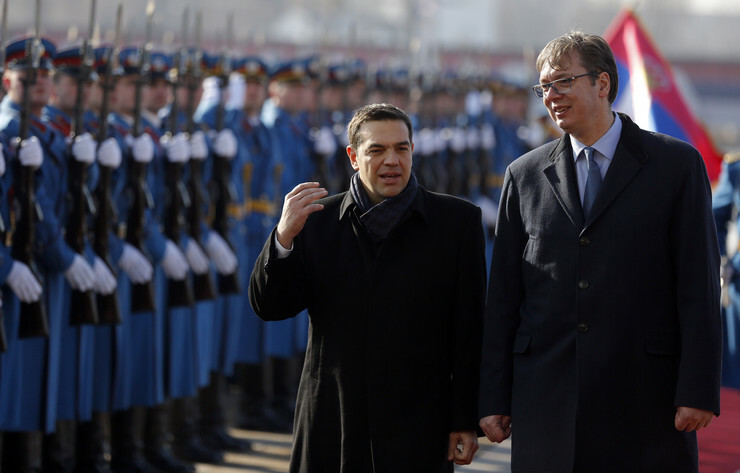 Serbian President Aleksandar Vucic used “North Macedonia” to refer to the Republic of Macedonia, during his meeting with Greek Prime Minister Alexis Tsipras. The two discussed Serbian – Greek relations after the treaty between Tsipras and Zoran Zaev to rename Macedonia. – The Prespa treaty should be implemented and North Macedonia should be come a bridge for cooperation between Serbia and Greece. We want to say that the road opened by the Prespa treaty is a road which Serbia welcomes and supports, Vucic said during the press conference. Vucic also said that in the future the two countries should invite “Skopje” for a trilateral meeting, and expressed hope that a high speed railway link, recently proposed by China, will be built between the three countries. Tsipras said that for 30 years “fyrom” was a gray zone between Serbia and Greece, but that now it can be a link between them. He also pushed the idea to connect Athens to Budapest via a high speed railway link and said that it will be the first international treaty which Greece will sign with “North Macedonia”. China bought the port of Athens and wants to use the Balkans as a gateway to transport its goods to the European market.